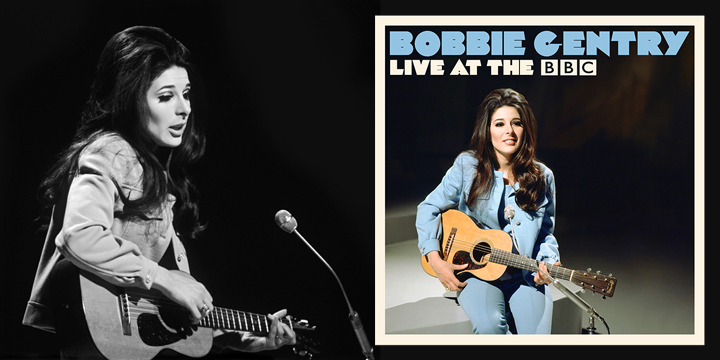 It’s with great pleasure that we can announce the forthcoming release of the LP Bobbie Gentry Live At The BBC for Record Store Day on 21st April 2018. Bobbie Gentry’s performances and on-screen charisma on variety programmes on both sides of the Atlantic had impressed the head of the BBC so much that early in 1968 she was invited to host her own show on BBC 2 making her the first female songwriter to front a TV series on the network. Together with producer and director Stanley Dorfman, they made six half-hour episodes every year for a total of 18 shows spanning 1968, 1969 and 1971. For someone who later became such a well-known stage performer, it’s surprising that this collection is Bobbie’s first album of live material to be released; backed by Musical Director John Cameron’s adept band it features recordings taken from episodes in 1968 and 1969. Bobbie’s performances of songs like Ode To Billie Joe and Refractions match and sometimes go beyond the intensity of their studio counterparts; and the medley of Nikki Hokey paired with Robert Parkers Barefootin’ feels joyous and inspired, showing just how effective Bobbie could be on more up-tempo material, whilst the sensuous croon of Mornin’ Glory and melancholy chamber pop of Recollection show Bobbie at the peak of powers as a writer and performer. Record Store Day, now in its 11th year, is hugely important for local, independent record stores. In 2017, shops in the UK sold an extra 32,500 vinyl albums in the week of the event, with sales of 12-inch singles jumping from 2,000 to 89,000.